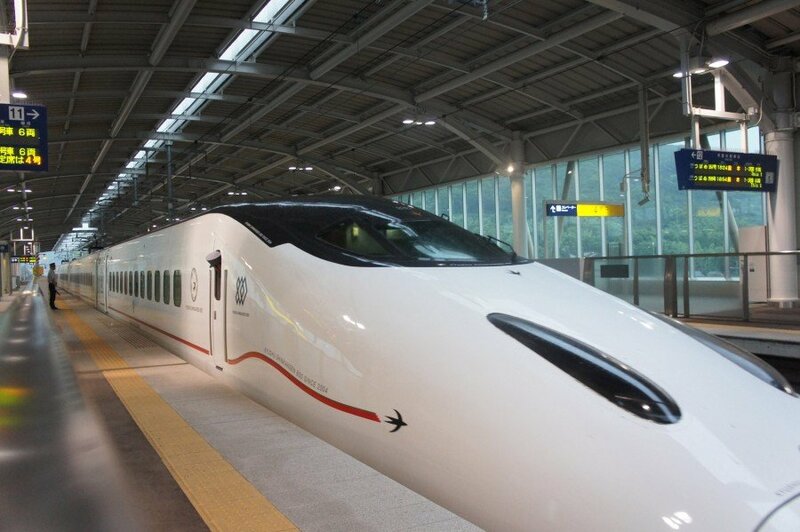 The Shinkansen (literally “new trunk line”), more famously known as the Bullet Train is a network of high-speed railway lines in Japan operated by four Japan Railways Group companies. (Note: The name Superexpress (cho-tokkyu) was retired in 1972 but is still used in English-language announcements and signage.) The network currently links most major cities on the islands of Honshu and Kyushu, but the construction of a link to the northern island of Hokkaido underway. The Tokaido Shinkansen is the world’s busiest high-speed rail line, carrying 151 million passengers per year between Tokyo and Osaka. At peak times, up to thirteen trains per hour with sixteen cars each (1,323-seat capacity) run in each direction with a minimum headway of three minutes between trains! How is it in a wheelchair? Pretty darn good! Unlike your run-of-the-mill train tickets, you need to go to a “Midori no Madoguchi” (“Green Ticket Window”) found in most major JR stations to buy a ticket. 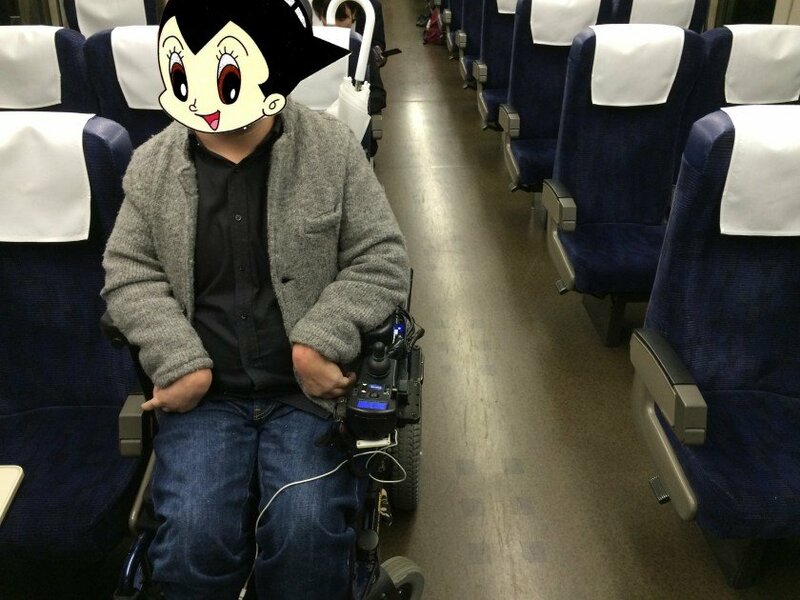 The Shinkansen has two different types of cars: unreserved seating, and reserved seating. To get on the train in the first place, everyone must buy a boarding ticket. With this you can use a seat in the unreserved cars. Unfortunately, this does not guarantee a seat, so you may be stuck near the hall between cars. If you want a seat that is all yours, you must pay an extra fee and will get a ticket showing your seat number (this is in addition to your boarding ticket). If you are a wheelchair user, your seating options are limited. It is possible to get just a boarding ticket and sit between cars. By far the better option is to get a reserved seat. While the boarding tickets can be purchased from a machine, it is best to talk to the teller. This can be a long and boring experience. When you tell the teller your desired destination and time of departure, they will excuse themselves and go to a back room where they call the people responsible for wheelchair seating. Since the spaces are limited, you may go back and forth a few times until a train with vacant wheelchair seating can be found. (Though you can often get your first choice). While you don’t need to show up super early (like with a plane), you should get to the ticket gate at least 15 minutes before departure – if you miss the train, you lose that reservation. Once through the gate, you will likely be directed to a waiting area where you will be re-collected by a station staff member 10 minutes before boarding. If you arrived early, you can use the accessible toilet or buy a boxed lunch for the trip. 10 minutes before boarding, a station staff member will appear, check your tickets and accompany you to the train. They will either be carrying with them, or pick up along the way, a small folding ramp. They will help you on the train where the train staff will direct you to your seat. There are two seating options available. The first option is with the regular seating. Most rows are made up of two groups of three seats with the aisle in the middle. For the wheelchair accessible space, one seat is removed and you can park yourself there. Technically, you reserved the seat next to the space, so feel free to sit in your chair or transfer over. The other option is the private room (“ko-shitsu”). While it looks small, a wheelchair can be maneuvered in and still allow for two companions to sit on the bench. The bench can also be converted to a bed. The door is also lockable to prevent people searching for the bathroom from opening the door every few minutes. 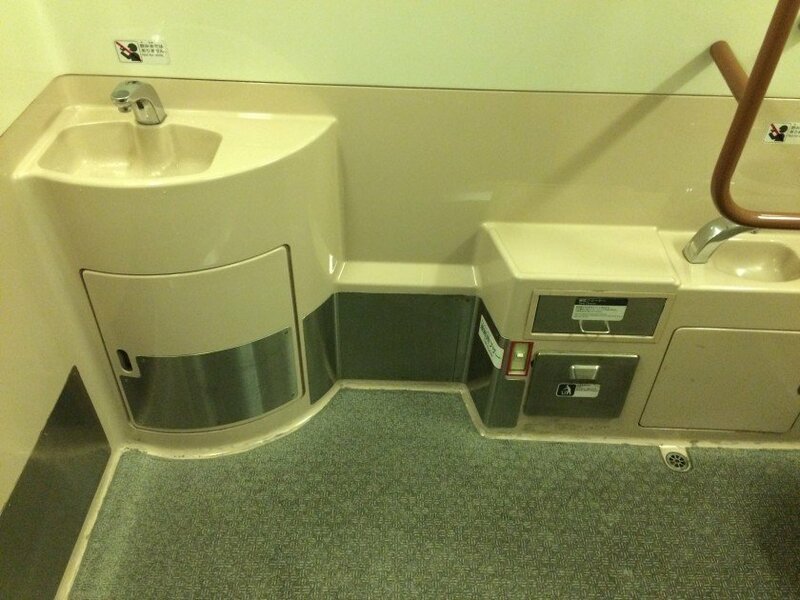 Speaking of the bathroom, another reason you will want to get a reserved seat is because the wheelchair accessible toilet is located in the same train car as the accessible seating! While not huge, considering the space restrictions, it is big enough. 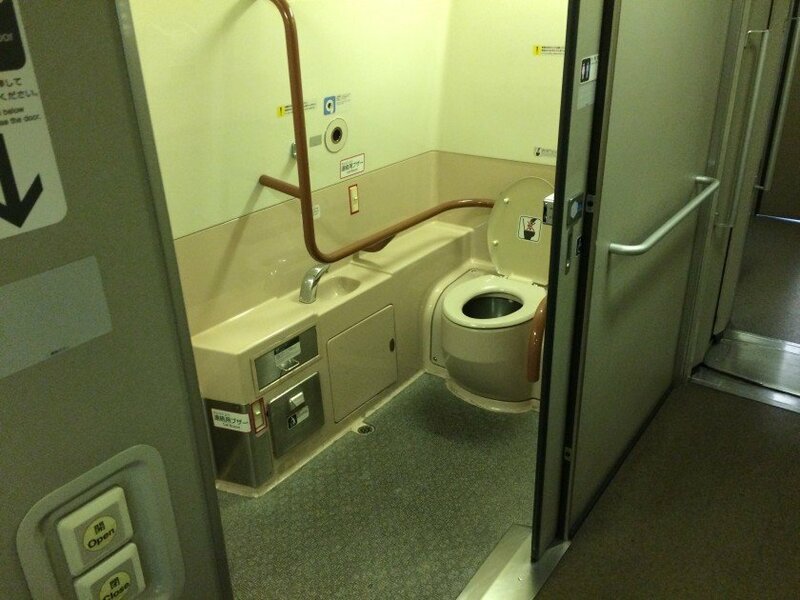 Unfortunately, when you get in, you will be facing the toilet, requiring a 180° turn in a cramped space. But it sure beats the alternative! The Shinkansen lines are all a bit different. 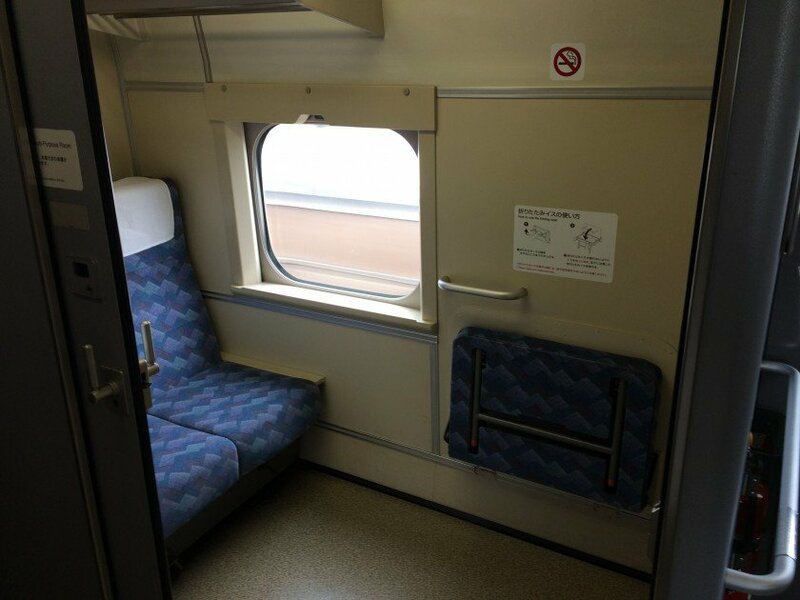 From personal experience, on the Tokaido Line, simple requesting the the private room is all that is required. On the northern Tohoku Line, you may be refused as they prefer to keep it open in case someone gets sick or for nursing mothers. 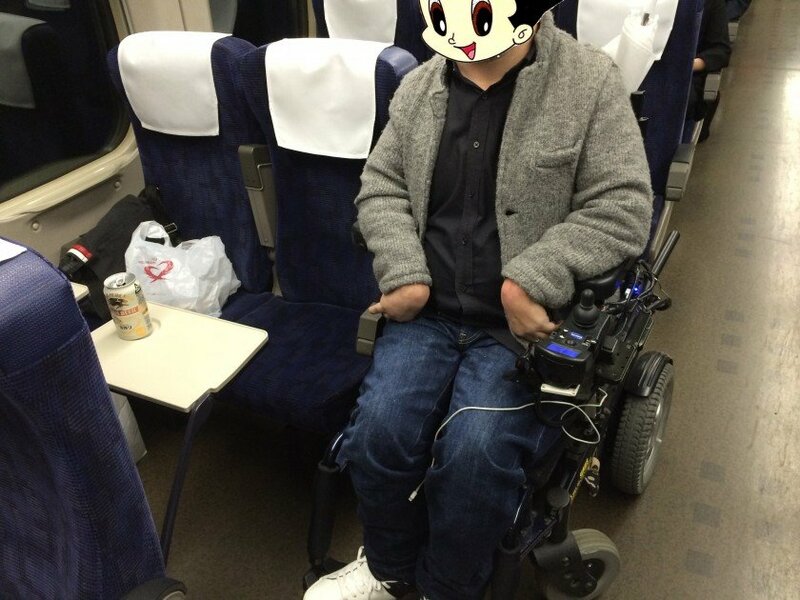 Additionally, the wheelchair space by the regular seats on the Tohoku Line isn’t very wide and you may need to move every time the refreshment trolly comes… not the best experience. Mileage may vary.